We offer full service guidance and gardening services focused on sustainability-focused food production. URBAN FARMING DASHBOARD – click here for information about all Business Grow’s urban farming services. Growing organic or no-spray food in the city is not only one of the best things we can do for our health, it's also a very effective way to reduce pollution and help the environment. Take advantage of Business Grow’s new urban food concierge service – providing food growing advice and services specifically tailored to clients' location and environmental conditions. We can consult with you to determine optimal food growing locations at your home or office, purchase all necessary equipment, install a garden, then show you exactly how to maintain and care for it to produce tasty, no-spray vegetables. Brochure. Beginners Food Growing Pack – contains practical food-growing guides, key advice, useful tips and fundamental information – in fact everything you need to know to start growing fresh, healthy, great-tasting no-spray food in the city this spring! Brochure. and rooftop gardening packages, please click HERE. Urban Farming Teacher Packs – a range of teaching guides that enable even inexperienced gardeners to grow food sustainably, boost self-sufficiency and help the planet. 10. Recycling everyday objects into planters. Urban Farming Teacher Pack brochure, here. Urban Farming Teacher Pack sample, here. Smart Food Packs – a range of teaching guides specifically focused on enabling even inexperienced gardeners to grow food sustainably, boost self-sufficiency and help the planet. Each off-the-shelf pack contains detailed instructions to enable readers to learn the topics shown under Urban Farming Teacher Packs section above. Smart Food Pack brochure, here. Smart Food Pack sample, here. For a 1-page summary of our gardening and urban farming services, please click HERE. For a brochure on urban farming, rooftop gardening, and our Urban Farming Starter Packs, please click HERE. Grow for Good: Corporate gardening for community growth, healthier people and a healthier planet. For a strategy document, please click HERE. Ginza Garden Sponsorship Proposal – A unique opportunity to learn about and take a stake in urban near-organic food production, improve your health, and directly protect the environment – in Ginza. To download an information brochure, click here. Food Havens – Create your own food haven in the city! Learn the joy and abundance of gardening as well as key information and skills to transform patches of sunlit land, walls, rooftops and other spaces in the city into food havens where you can grow a wide range of healthy, no-spray food. Brochure. Urban farming consultant Jonathon Walsh is available to give presentations and seminars about urban food production, boosting self-sufficiency, and related sustainability issues. We also provide a range of hands-on gardening training classes with accompanying handouts. To see our urban farming classes in action, please download a brochure here. Jonathon is also teaching sustainability lessons to school children (> Brochure). Lesson reports can be downloaded below. Urban Self-Sufficiency Premier Package (USSPP) – a comprehensive package of essential information and practical ideas to help sustainability-minded people grow food, save water, boost self-sufficiency and be kinder to the planet – wherever they live or work. How to extend harvest and maximize yield, and much, much more. Urban Self-Sufficiency Premier Package brochure, here. How to get what you want without paying for it [article] – Six ways to get off the grid, boost self-sufficiency, save money, and help the environment. Making Every City Sustainable [article] – A vision of how to create more sustainable families, communities and cities. 2. Practical solutions and strategies that can be implemented at a local level by individuals, households and communities to help people cope, thrive and survive the impacts of climate change – a battle we are fighting against ourselves for the very future of our species. How to Set Up a Rain Collector - A simple guide to harvesting rain water. How to Set up a Rooftop Garden - A starter's guide to building a rooftop garden. How to Grow Plants in Pots - Key information on how to produce healthy food at the home or office with minimum fuss and potentially impressive palate-pleasing results. Feeding the Future - 15 methods that can - and are - being used to feed the world's expanding population. Many of these methods will be valuable during emergencies if food distribution links have been broken. Twin Killer Quakes Trigger Sustainability Drive [article] - How two deadly earthquakes drove a first time gardener to create an innovative sustainability-focused lifestyle in Japan's largest metropolis. We also offer a range of Sustainability Packs containing practical hands-on guides and information to help individuals, families, businesses, communities, towns and cities become more self-sufficient – within days – by growing kilograms of healthy, near-organic food and capturing thousands of liters of rainwater, and more. GroBrick kits contain everything you need to grow herbs and vegetables at the home or office. They bring life to virtually any space, healthy food to your plate, farming to the city and greater independence to your life. Jonathon Walsh has re-built the rooftop garden at Tokyo International School, set up plants and planter boxes around the premises, and educated teachers and students in the art of growing food in the city. 'SUSTAINABILITY IN THE CITY' is a new monthly newsletter presenting news, advice and information focusing on the basics of life in the city: growing and eating healthy food and living in greater harmony with the environment. 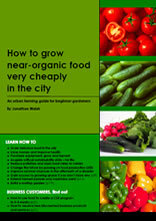 Urban Farming Guide: How to grow near-organic food very cheaply in the city. This 23-page beginner’s guide contains everything you need to know to grow healthy, delicious food in the city – minus harmful chemicals. Learn how to sow, grow and harvest safe, healthy and great tasting near-organic food at the home, school or office. Japan School News [10/2013] – Jonathon’s urban farming work at Tokyo International School was featured in the October 2013 issue of Japan School News. Click here to read. (See top of p2).